Have you ever considered how your dog feels or what he or she thinks? Dogs, like people, have emotions such as fear, uncertainty, joy, happiness, excitement and even sadness. 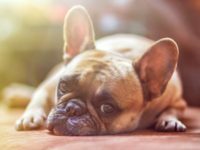 Many people are unaware that dogs can suffer from depression or other psychological problems such as Single Event Fear Learning also known as Post Traumatic Stress Disorder (PTSD). Dogs are influenced culturally, just like people. What they have been exposed to, or not exposed to, can make them either more comfortable, excited or nervous. So let me ask you this; have you ever looked at life from Fido’s perspective? I have. And what I came up with is that every dog’s take on life is much like any individual person’s. Like people, some dogs get out more than others and do better in social situations. Some are homebodies. Some don’t do well with change, and some due to being in a more secluded situation don’t do well in new places, with new people or new dogs. From personal experiences almost twenty years ago, I’ve realized that boarding is such a simple concept but it is truly complex when you begin to consider the dog’s emotional needs. We take the time to look into those needs because your dog’s physical and emotional well-being are important to us, to you and to your dog.